My most memorable experience with contact lenses was in high school and led to me almost blinding my cousin Makenzi for life!! Makenzi was sleeping over and I was going to take her to meet my boyfriend. We were going to be late because she was taking forever to put in her contacts so I offered to help. She had forgotten her drops, I have no clue to this day what kind of drops, and asked me to look through my brother’s contact stuff to see if he had any. She said it was a white bottle with a blue lid so I grabbed the first one I saw and handed it to her. Without looking at the label, she put it in her eyes. Immediately she started screaming and splashing water in her eyes. Luckily, whatever it was she put in her eyes didn’t blind her, but her eyes were super red for the next few days. I definitely learned from that experience that properly caring for contact lenses is not to be taken lightly! Her eyes could have been seriously injured by a careless mistake. Because contact lenses are among the safest, most popular forms of vision correction, nearly 41 million adults in the U.S. (more than one in ten people) and 125 million people worldwide wear contact lenses. Contact lenses aren’t just for adults, many children also benefit from wearing contact lenses. In fact, optometrists agree that most children between the ages of 10-12 are mature enough to wear and care for contact lenses, in some cases, children even younger than age 10 are ready for independent contact lens wear. 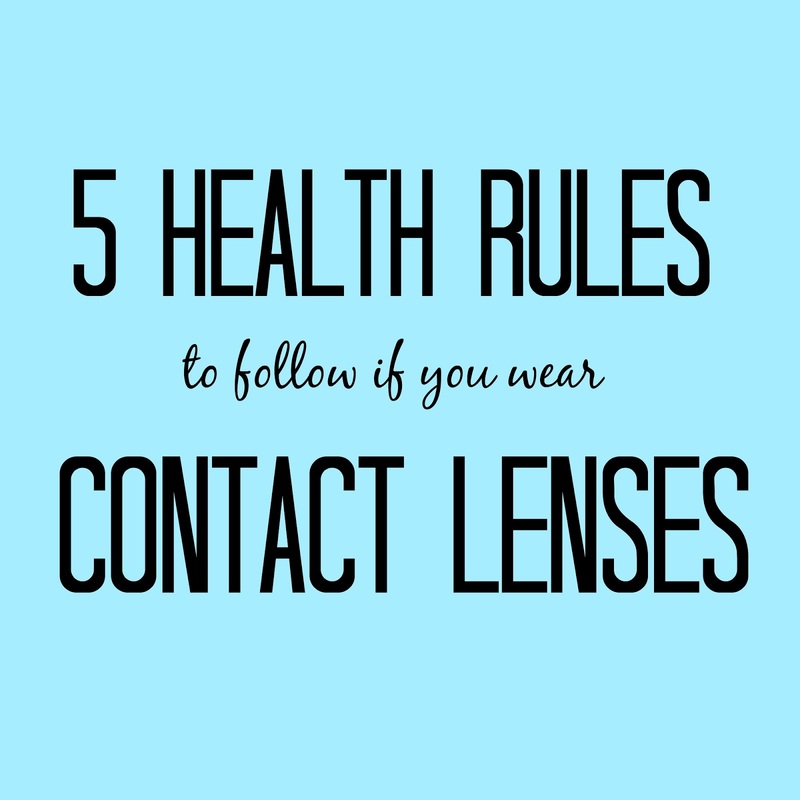 Below are 5 health rules to follow if you wear contact lenses. 1. Annual Eye Exams: Contact lens wearers should have comprehensive eye exams annually and stay in close contact with their eye doctor to ensure appropriate and up-to-date clinical guidance based on individual eye health needs. 2. Use Only For Suggested Duration: According to the American Optometric Association’s 2015 American Eye-Q® Survey, more than half (59 percent) of Americans wear disposable contact lenses longer than the suggested duration. This bad habit can cause permanent eye damage from bacterial infections and oxygen deprivation. Removing contact lenses before exposing them to water. 4. Avoid Decorative Contact Lenses: Often times, decorative contact lenses are acquired illegally – through street vendors, flea markets, or beauty supply stores – without an eye doctor’s prescription and guidance. When purchased illegally, these contact lenses often don’t meet quality and safety standards set by the U.S. Food and Drug Administration, which is a major concern for optometrists. These lenses are not merely a fashion or costume accessory, decorative contact lens wearers who don’t follow the guidelines for use and wear can experience symptoms such as blurred or fuzzy vision; red or irritated eyes; pain in and around the eyes or, a more serious condition where the cornea becomes inflamed, also known as keratitis. These problems can lead to significant damage to the eye’s ability to function, and even irreversible sight loss. 5. Research and Choose a Trusted Optomistrist: Optometrists provide a lifetime of vision care and play a key role in a patient’s total quality of life. Proper vision can affect how well a person functions and succeeds in life. Poor vision has been linked to developmental problems. Yearly eye exams are important for eye and vision health. 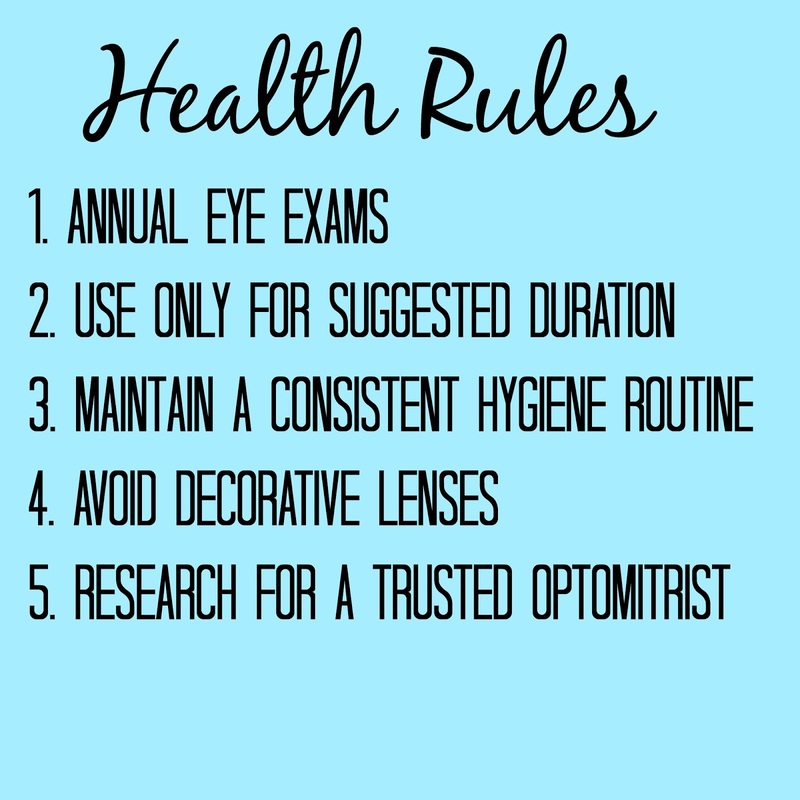 Visit the American Optometric Associations website To learn more about health rules and the use of contacts.